Harvested from the waters around the Mediterranean, this species of fish has a shiny silver skin that is consistent in color throughout its body. 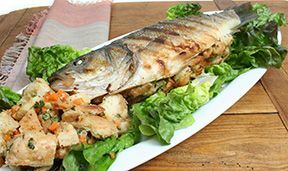 Similar in appearance, size and preparation to a medium size trout, the Bronzini is served as a whole fish with the head on. It is commonly available weighing from 2 to 3 pounds in size. Often referred to as a Mediterranean Sea Bass, this fish can be easily prepared using olive oil and seasonings such as garlic, various herbs, sea salt and pepper to be roasted in an oven, on a stovetop or grilled. The sweet-flavored, semi-firm white meat of the Bronzini tastes somewhat like a red snapper.